On 19th May, over 200 people including around 50 children from the VHP Hindu Centre where they run Hindi and various other languages classes from India attended this event from 10am to 1pm. Event:- Volunteer teachers run classes in GCSE Hinduism, Hindi, Kannada, Gujarati, Sanskrut, and Marathi. 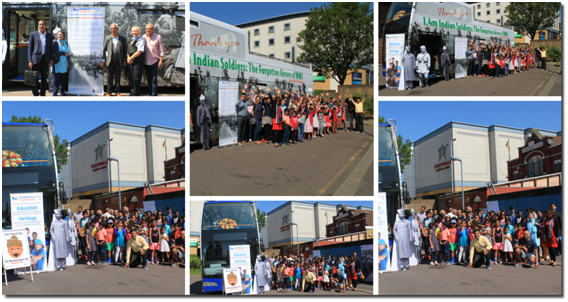 The students from each class came groups to visit the WW1_Exhibition Bus.. Visitors:- Over 200 visitors ‘hop-on’ the WW1 Exhibition Bus. Most them watched the entire video (http://bit.ly/India1914_WW1_Bus). The local Councillors and other dignitaries also showed appreciation while visiting this mobile exhibition. ‘Post cards’ to the Soldiers were distributed and encouraged to go home and visit the India1914 website as a family to thank and remember the sacrifice of the Indian solders and the entire generation the lived throughout the first great world war.